Thank you for considering listing on SacWellness! This is the tour area of the site. 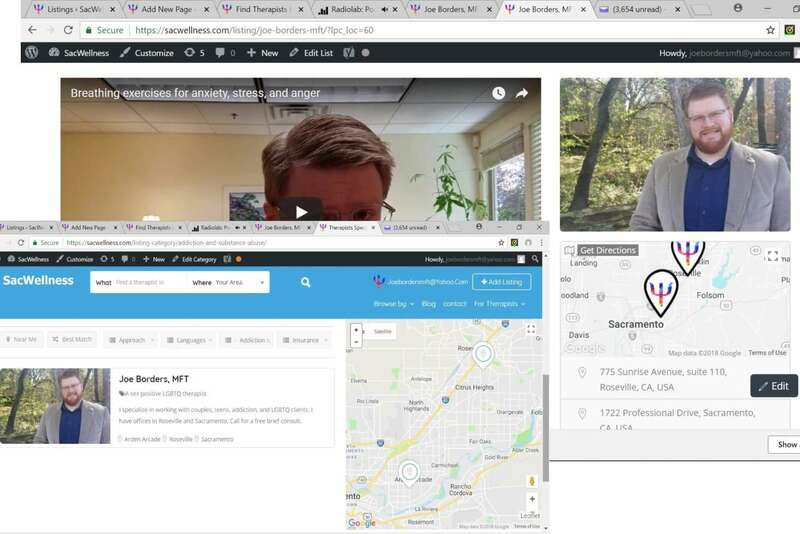 Here you can see how SacWellness works and how your listing will appear on the site. These are the top ten reasons to join SacWellness. Click any of the tabs on the left to read more about any of these points. Select a collection of images to show potential clients. Having a listing on on SacWellness only costs $17 per month. This is half the price of other directories like psychology today. We won’t be sending you a monthly magazine, but we will be focusing all of our energy on what matters most; getting lots of potential clients to visit our site and see your listing. Listings are free till 2020! SacWellness was created and is maintained by Joe Borders, MFT and his wife, Angela Borders, who are locals to the Sacramento area. We have the potential to outrank big directories like psychology today in search rankings. Think of it like this: psychology today is like a giant international phone book, and we are like a much smaller local one. If you were a search engine wanting to deliver the most useful information to your users, would you give them the giant international book, or the local one? Brand recognition: When you stop and think about it, the only reason any non-therapist knows psychology today is because they either find it on the internet or a therapist told them to go there to find referrals. It is our goal to become the thing everyone points to when they don’t know where to refer someone. Eventually SacWellness will be known in the area and people will think of it when looking for referrals. We’re dedicated to working on our site, blogging, and doing everything we can to get SacWellness to be the best it can be! In our first year we’re planning on spending at least 60% of earned income on building and advertising the site. We don’t know what other people spend on their sites, but we’re expecting that this expense will slowly taper off as we rank in search engines, but we will never spend less than 10% on advertising. We’re going to spending a lot of time writing and publicizing quality blog posts. This is a key part of any good SEO strategy and we will be doing lots of other things to boost our rankings in search engines so that clients will find our site and see your listing. If you’re interested in seeing some of the plans we have for SacWellness as well as the things we are working on and have completed you can check out our updates and changes page. 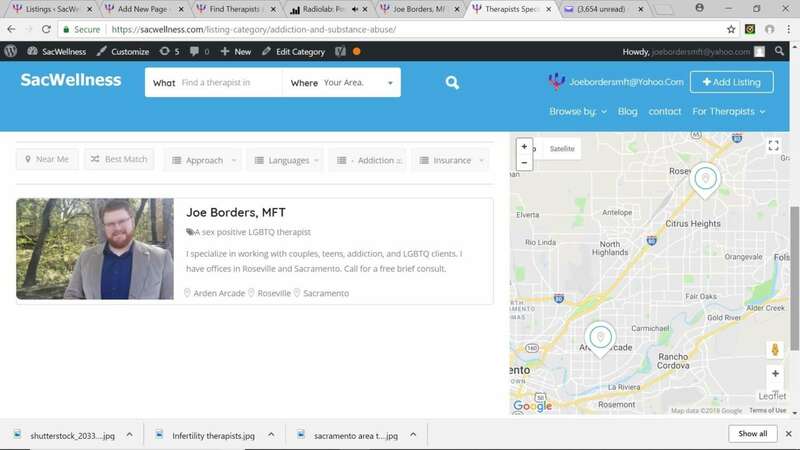 Users can browse locations by city and by neighborhoods in Sacramento. Your office locations will appear on maps located both on search pages and on your listing. 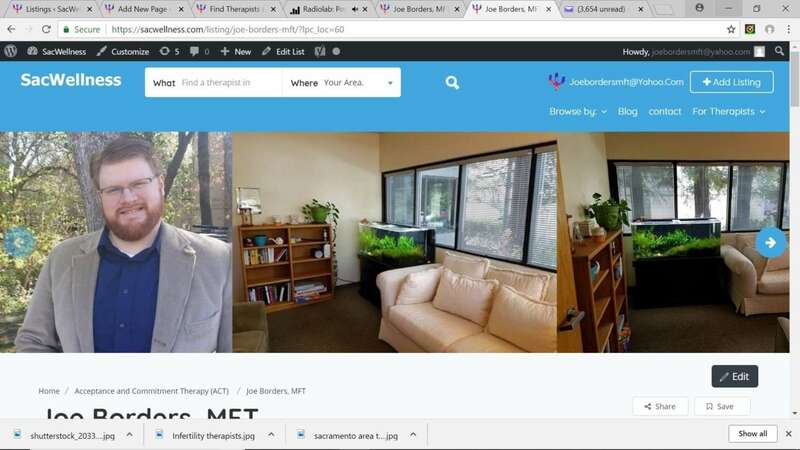 On SacWellness, you can add a YouTube video to your listing to give potential clients a better idea of who you are and your approach to therapy. 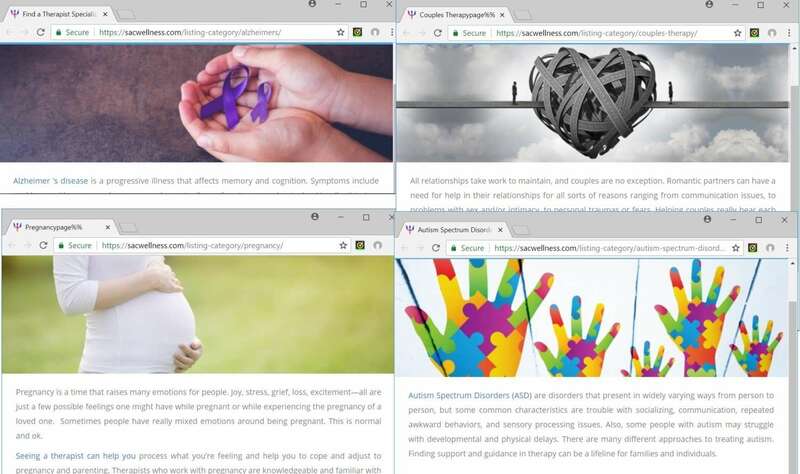 Users can browse by issues, insurance, language, location, and therapeutic approach. SacWellness is easy to use. Users can search for issues, approaches, languages, locations, and insurances using the search bar on every page, or by browsing through our category pages. 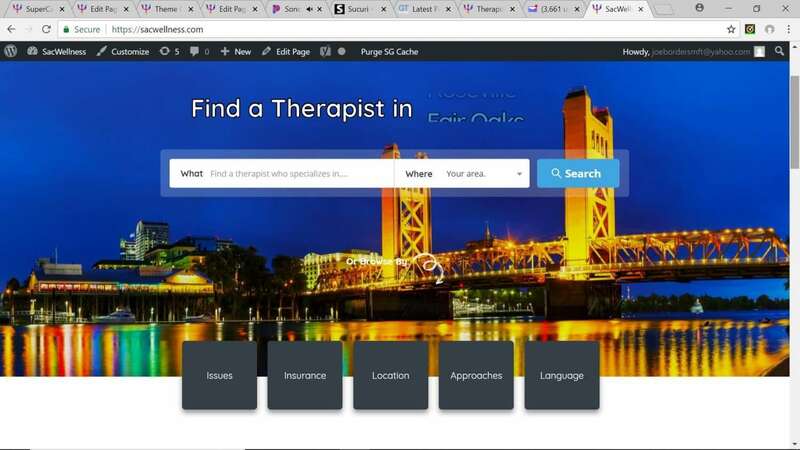 Users can also refine their search results to find therapists who specialize in specific issues, work in certain areas, practice from a specific therapeutic approach, etc. All while viewing locations on a map. As a SacWellness member, you can also choose to write a guest blog that would be featured on our front page and included in our social media marketing. Click here to read more about guest blogging on SacWellness. SacWellness allows you to choose images to show potential clients in a scrolling carousel at the top of your listing. When you join SacWellness you’re joining a community. We are really aiming for this to become a resource for the greater Sacramento community. This site is for Sacramento and Surrounding areas, unlike many other directories that are spread out across the country/world. We plan on blogging about local news, talking about local events, and advertising locally. We are currently in the process of setting up advertisements on Capital Public Radio, for example. 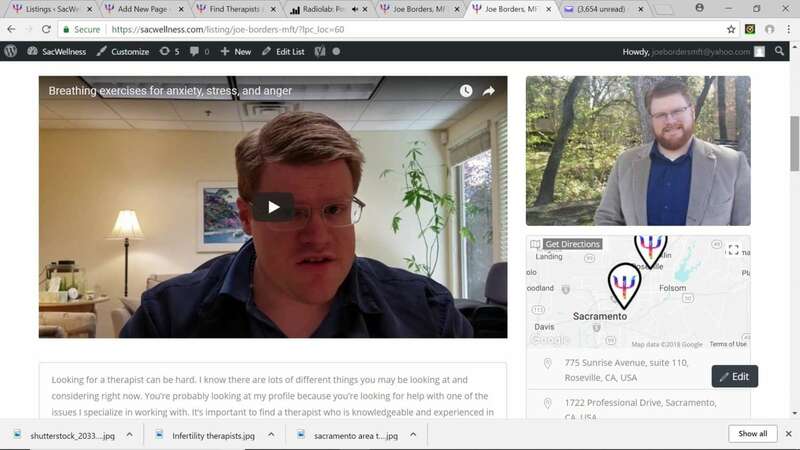 Whether it be by contributing to or reading our SacWellness blog, connecting in person or online through social media, or just being more visible to each other and potential clients, we hope SacWellness will serve as a way for therapists all over the Sacramento region to connect and work together to help our community. Your Name Also, to see a sample profile, click here.